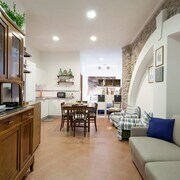 Situated in Vernazza, this apartment building is steps from Church of San Pietro and Lardarina Staircase. It's an unusual place; worked for us. There are 3 or 4 apartments. Ours was on two levels - a bit precipitous going down the stairs during the middle of the night to the bathroom. Also precipitous is walking over open steps to get from the bedroom to access to your private balcony, which really does have a great view. Our room was listed as a "quadruple" but it was really a double with a small pull out coach downstairs. Main warning: you really should not go here if you have a lot of heavy luggage. While close to the train station, there are lots of stone stairs going up to the unit. Lisa and Lorena were excellent hosts with great advice and tips for touring the area. The apartment was clean, comfortable and modern. The wifi was not working when we stayed there but everything else was perfect. 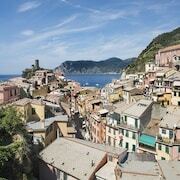 Where to find Vernazza hotels near an airport? 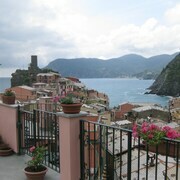 Where can I find hotels in Vernazza that are near tourist attractions? Hotel options are aplenty in Vernazza. Spend some time perusing Expedia's 87 hotel listings, which are all within a 0.1-kilometre (0.06-mile) radius of central Vernazza. If you are looking for accommodation that is only a stroll from the center of Vernazza, Villa Cinque Terre and Appartamento Cinque Terre Holidays will be perfect. 1 kilometre (0.6 miles) from the center of Vernazza is the Rollando Affittacamere. This hotel is a great option for those who are looking for economical options. 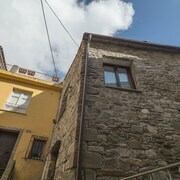 The Camere La Torre is a second cost-effective option in Vernazza. 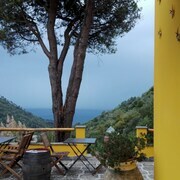 18 kilometres (11 miles) from downtown Vernazza, is the Piccolo Hotel Del Lido. Alternatively, the Hotel Porto Roca is positioned 3 kilometres (2 miles) away. 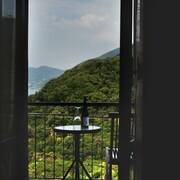 Two more places to stay worth checking out around Vernazza include the Park Hotel Argento and the Royal Sporting Hotel. Portovenere is 15 kilometres (9 miles) to the southeast of Vernazza and is home to the Church of St. Peter and Sporting Beach. Expedia-listed Portovenere hotels and accommodations include the Hotel Paradiso and Hotel Belvedere. Or stay in San Terenzo, 17 kilometres (10 miles) to the east of Vernazza, where you'll find the Hotel Byron and Hotel Florida Lerici. The La Baia Blu and San Terenzo Castle are a couple of the popular places to explore when visiting San Terenzo. Get your sporting fix with a trip to Genoa Stadium, which is 65 kilometres (42 miles) to the northwest of Vernazza. Stay near the action at the Hotel Ricci or the Bristol Palace Hotel. Cristoforo Colombo Airport is a nearby airport for accessing Vernazza. It is 75 kilometres (46 miles) drive away. If you choose to stay nearby, try the MarinaPlace Resort & Spa or Tower Genova Airport Hotel & Conference Center. What are the most popular Vernazza hotels? Are there hotels in other cities near Vernazza? 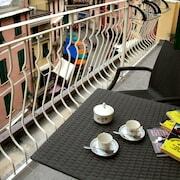 What other types of accommodations are available in Vernazza? 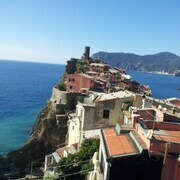 Explore Vernazza with Expedia.ca’s Travel Guides to find the best flights, cars, holiday packages and more!